For all I'm aware Fuzz Club was the only place in the world where The Blood Arm's star shone brightly. Circa 2006 'Suspicious Character' was a massive dancefloor hit. Played every week no one grew tired of it's tongue-in-cheek relentlessly fun tune. Parent album Lie Lover Lie was similarly excellent. They'd asked for our attention. Got it. And then disappeared. 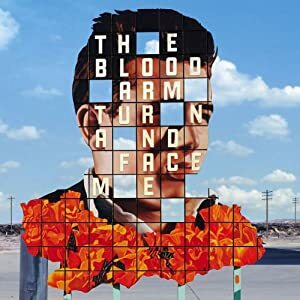 Now, finally The Blood Arm have returned with Turn And Face Me and at a trim thirty five minutes it picks up from where they left off all those years ago. Unearthing the uncool sounds of pre-Beatles America and throwing the diverse mix into a satisfying slice of pop, the band rattle through their set with the vigour and humour of any number of British acts. It's no wonder they once toured with We Are Scientists. Perhaps they even took some musical inspiration from them too. Turn And Face Me's lead single 'Relentless Love' marries the wiry guitars of WAS to a bouncing drum machine that recalls the legendary Bis. It's the nearest you get to a contemporary reference to their sound. 'I Need You' for instance is like Jerry Lee Lewis giving a group of junior Stooges a sugar rush. Fuzzy guitars threaten to overrun the piano for the first time, before the instrument makes a classic rock n roll comeback. Great balls of fire indeed. The spectre of show tunes erupts on 'Starved For Affection', a song which shows The Blood Arm need not keep to a single pace. Going for a big finish there's a musical feel that's at once with their excellent showmanship. This live feel comes through on the record, which bursts of brass aside, feels at once crisp and cutback. There's no mess of production interfering, it's all kept back to the basic band set up. More wonder then that they manage to come out with the swinging 'Don't Let Him Break Your Heart' and Hawaiian flavoured closer 'Forever Is Strange'. One thing is for certain, The Blood Arm do not operate in the hermetically sealed bubble of indie rock. There's often the impression they've been rifling through their grandparents record collection for elements to pinch and borrow – a practice of pilfering guilty pleasures you might argue if you believed in the concept. In wiser times this sound combined with often nonesencial lyrics ('Introducing Randy Newman' and 'D-D-D-D-Dementia') would have got the band onto television and a crossover to a wider audience. The racing good fun of The Blood Arm will delight anyone who gets what I mean with the phrase Keep Pop Loud. Turn And Face Me is a superb new-wave record that melds all of it's influences nicely into a unique sound that's upbeat and unmistakable. Full marks.